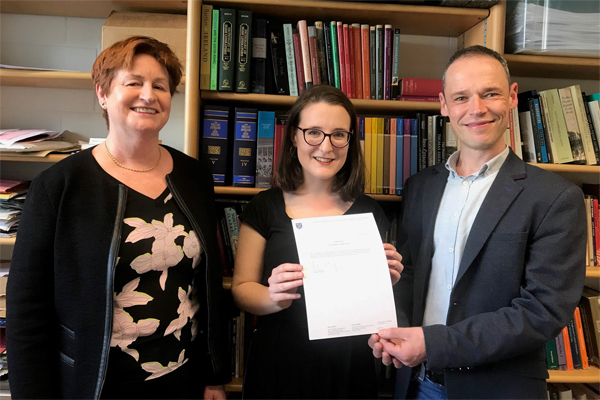 Many congratulations to Orlaith Darling, a Senior Sophister student in the School of English, and winner of this year’s Edward Millington Stephens prize. “I am thrilled”, Orlaith remarked on hearing the good news, and “I would highly encourage other English students to enter their work for this and other prizes like it”. Orlaith received her well-deserved award this week, meeting with Prof Aileen Douglas (Head of School) and Dr Paul Delaney (Head of Discipline). “Orlaith is a very worthy recipient of this year’s composition prize”, Paul commented. “Her essay on Molly Keane and food was wonderful – elegant, informed and most astute.” The Edward Millington Stephens prize is an annual composition prize that is awarded by the School of English. It was founded in 1972 by a bequest from Mrs L.M. Stephens, and is awarded each year for an essay on some aspect of the Anglo-Irish literary movement. The topic for 2018 was ‘self-help’.